Verh. Zool.-Bot. Ges. Wien 61: 47. 1911. Blastenia sect. Protoblastenia Zahlbr. in Engler & Prantl, Natürl. Pflanzenfam. 1(1*): 226. 1907. Crustose lichens on carbonate rocks, with thin, superficial or immersed, grayish to pale brownish thalli and sessile, convex, orange to orangish brown apothecia (KOH+ purple, parietin), thalline margin absent, photobiont chloroccoid, asci Porpidia-type, with 8 colorless, ellipsoid, simple spores; 2 species in the region. It is possible to confuse Protoblastenia with Caloplaca which also occurs on lime rich substrates and has KOH+ purple apothecia. In the field the broadly attached swollen dull rusty orange apothecia are ± diagnostic. Confirmation may be obtained by examination of the spores, undivided with uniform walls in Protoblastenia, divided and with thickened walls in Caloplaca. 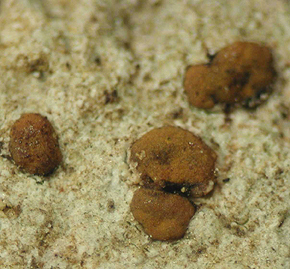 The two species can be separated on the thallus characteristics and P. rupestris usually has a paler apothecial margin, while doubtful cases may have to be examined for the differences in hypothecium and spore width. Thallus immersed in rock, visible as pale green gray stain. Apothecia rusty orange, matt, often orange pruinose, weakly to strongly convex (margin not visible at any stage), broadly attached, constricted at base, 0.3-0.5 mm in diameter. Exciple poorly developed, colorless. Hypothecium colorless, obscured by dense colorless granules (not dissolving in KOH). Ascospores narrowly ellipsoidal to ellipsoidal, 9-(11)-13 × 4-(4.9)-5.5 µm. 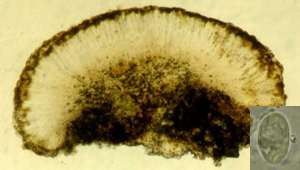 Pycnidia sparse or numerous, blackish, immersed in rock, 1-1.5 mm in diameter, with microconidia or macroconidia and in one case with both in single pycnidium. Microconidia broadly rod-shaped, ca. 7 × 1.5-2 µm. Macroconidia broadly ellipsoid or with one end ± swollen, 11-14 × 4-5 µm. Protoblastenia ozarkana is endemic to the Ozark ecoregion, known from four sites on either side of the Arkansas-Missouri line on opposite sides of the region. When enough data are available, it may confirm our initial guess that P. ozarkana favors more open, drier sites than P. rupestris. The Missouri collections are on dolomite, the Arkansas collection on limestone. ARKANSAS. Sharp County: Strawberry River Preserve, off Barnes Road (Co. Rd. 9), 3 mi NE of AR 56, 36° 05'05"N, 91° 31'53"W; limestone bluff above Strawberry River in mixed hardwoods, 25 Oct 2001, Harris 45481 (NY). MISSOURI. Barry County: Roaring River State Park, ravine N of cabins NW of Nature Center along CR F, 36° 34'50"N, 93° 50'00"W, E-facing slope with dolomite outcrops in Quercus-dominated forest, 3 Nov 2000, Buck 38865; McDonald County: Huckleberry Ridge Conservation Area, ca. 3 mi E of Pineville, end of road 1460, 36° 35'N, 94° 19'W, T22N, R31W, sec 31 SE1/4, 335-350 m, limestone-chert glade on slope above ephemeral stream, in dry oak woods, 29 Oct 2000, Buck 38379 (both NY); Taney County: Mark Twain National Forest, Hercules Glades, along trail S of Long Creek. On SE facing slope in openings with sandstone rock and grass. Sec. 15, T23N, R18W. 1 Sep 1991, Wetmore 68700 (MIN). Verh. Zool.-Bot. Ges. Wien 61: 47. 1911. Lichen rupestris Scop., Fl. Carnol., ed. 2, 2: 363. 1772. Thallus superficial, grayish (sometimes darkened by algae, etc. on surface), pale gray-brown or tan, matt to slightly shiny, divided into areoles by narrow to broad cracks, rarely smooth, occasionally only patchily developed. 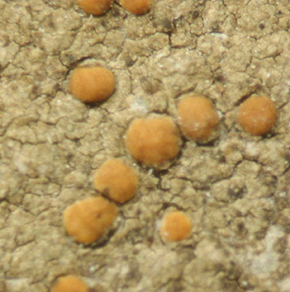 Apothecia with orange disk darkening to orange-brown (occasionally discolored blackish), with yellowish margin darkening to orange and eventually disappearing, epruinose, weakly to strongly convex, broadly attached, weakly to strongly constricted at base, reaching 0.8 mm in diameter. Exciple colorless, with ± radiating hyphae. Hypothecium colorless to pale buff or orangish, without granules, sometimes extending stipe-like into the thallus. Ascospores ellipsoid to broadly ellipsoid, 11-(12.2)-13 × 6-(7.1)-8 µm. Pycnidia rare, inconspicuous, immersed, very pale orangish (KOH+ weakly red), ca. 50-100 µm in diameter. 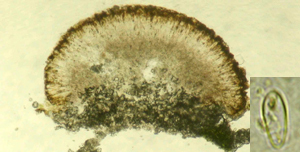 Microconidia rod-shaped, 6-7.5 × 1.5 µm. Macroconidia not seen. Parasymbiont: Muellerella lichenicola (Sommerf.:Fr.) D. Hawksw. Locally frequent on lightly shaded dolomite, particularly on horizontal surfaces of both larger rocks and ledges and small fragments. Typical habitats include the lower edges of glades and along small runoff streams in upland waterways.